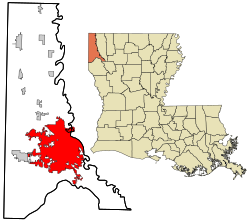 Motto(s): "The Next Great Ceety o the Sooth"
Location in Caddo Pairish an the state o Louisiana. Shreveport is the third-lairgest ceety in the state o Louisiana an the 113t-lairgest ceety in the Unitit States. This page wis last eeditit on 29 Mairch 2018, at 02:41.